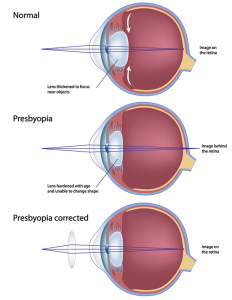 Astigmatism is a common eye condition that is corrected by eyeglasses, contact lenses, or surgery. 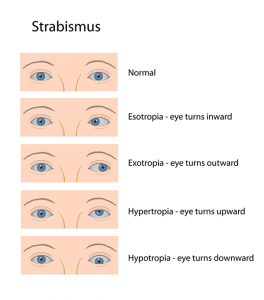 Astigmatism is characterized by unequal curvatures of the cornea. 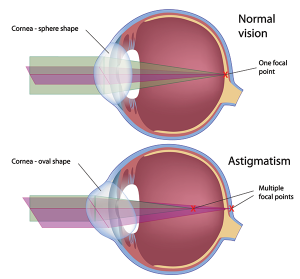 Astigmatism can occur in nearsighted, farsighted persons, or can be found alone , in all cases it results in blurry vision. A person’s cornea is spherical in shape amd when light enters the eye, the cornea refracts or bends light creating a clear image of the object. However, the eye of a person with astigmatism is shaped more like a football or the back of a spoon. For this person, when light enters the eye it is refracted more by one curve than the other, resulting in a blurry image. Corrective lenses (eyeglasses or contact lenses). 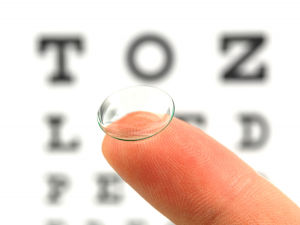 For astigmatism, special corrective lenses called toric lenses are prescribed. Toric lenses have greater light bending power in one direction than the other. After performing various tests, your eye doctor will determine the ideal toric lens prescription for your astigmatism. Refractive surgery. Another method for correcting astigmatism is by changing the shape of the cornea through refractive or laser eye surgery. While there is more than one type of refractive surgery, specific treatments are recommended on an individual basis. 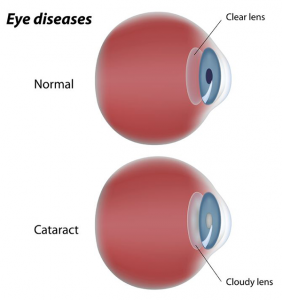 Most cataracts develop slowly and don’t disturb your eyesight early on. With time, cataracts will eventually interfere with your vision, but don’t worry now a days it is easy to correct with a simple procedure. 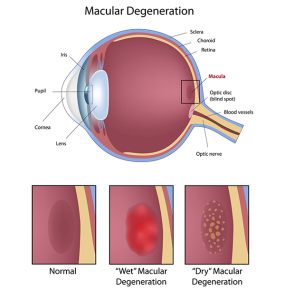 Retinal detachment affects approximately 1 in 10,000 people each year. 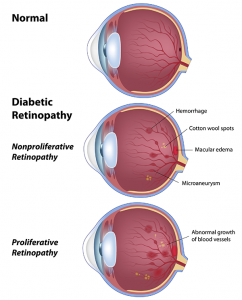 If left untreated, most retinal detachments will lead to loss of vision. An understanding of some of the normal anatomy of the eye may be useful in understanding how retinal tears and detachment occur and the symptoms which they may cause. The retina is a thin tissue that lines much of the inside of the eye. The center portion of the retina is called the macula. The macula is responsible for fine central vision and for color vision. 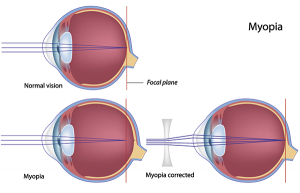 The more peripheral parts of the retina provide peripheral vision. The vitreous is a jelly like substance, which fills the center of the eye. The vitreous is normally clear and as such will normally not affect vision. 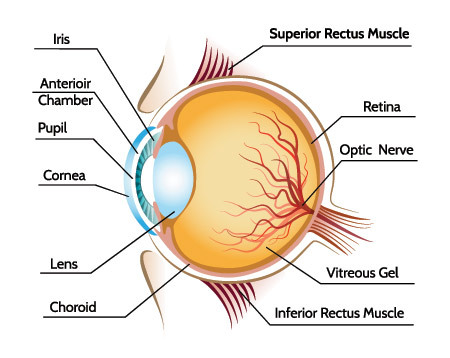 The vitreous is attached to the retina in many areas. In some regards, the way in which the eye works may be compared to a camera. In a camera, light is focused by the lens onto a film, where an image is formed. 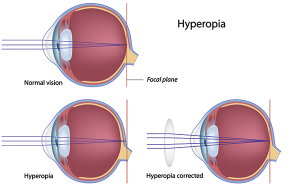 In the eye, the cornea (a clear structure forming part of the front wall of the eye) and the lens focus light onto the retina where an image is formed. The retina then converts this image into neural signals, which are transmitted to the brain. Floaters, flashing lights and posterior vitreous detachment: When we are young, the vitreous is normally a clear structure which does not affect our vision. As we age, however, changes may occur within the vitreous. Some parts of the vitreous may become more liquefied; other parts of the vitreous may condense and start to shrink. As the vitreous shrinks it may pull away from its attachments to the back part of the eye. This separation of the vitreous from its attachments to the back part of the eye is called a posterior vitreous detachment. Posterior vitreous detachments occur as a normal aging event but may be more common or occur earlier in people who are nearsighted (myopic), have undergone cataract surgery or who have had eye trauma or inflammation. Retinal tear and detachment: As the vitreous pulls away from the retina during a posterior vitreous detachment, the retina may at times tear. Retinal detachment occurs if fluid from within the vitreous passes through the tear and collects under the retina, causing the retina the separate from the underlying tissue (retinal pigment epithelium). The retinal tear may be associated with the symptoms of a posterior vitreous detachment (flashing lights and floaters). However as most retinal tears occur in the more peripheral parts of the retina, a retinal tear will usually not cause loss of vision unless there is progression to retinal detachment. 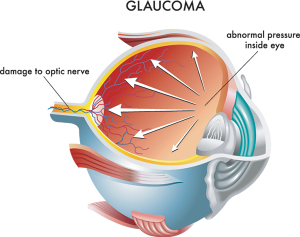 The detached retina is not capable of normal sight and as the retinal detachment enlarges and approaches the central part of the retina there will be an enlarging area of vision loss. This is sometimes described as a shadow or veil covering the vision. Sometimes retinal tears occur without associated floaters or flashing lights. In these cases, the first symptoms to occur may be the loss of vision due to retinal detachment. Treatment of Retinal Tears: Retinal tears can be treated using either laser photocoagulation or cryotherapy. Laser photocoagulation is a procedure where a special light is directed to the retina and used to create burns in the retina surrounding the retinal tear. Cyrotherapy is a procedure where a freeing probe is placed on the surface of the eye and used to create a freeze extending to the retina surrounding the retinal tear. Whether laser photocoagulation or cryotherapy is used, as the eye heals a scar will form sealing the retinal tear and in most cases preventing a retinal detachment from occurring. Both laser photocoagulation and cryotherapy are usually performed in the doctor’s office. Treatment of retinal tears is usually successful in preventing retinal detachment. Unfortunately, occasionally even after treatment of a retinal tear, retinal detachment may still occur. Therefore, if any new symptoms arise following treatment of a retinal tear, the retina should be re-examined and even in the absence of new symptoms, continued follow-up after treatment of a retinal tear is needed. 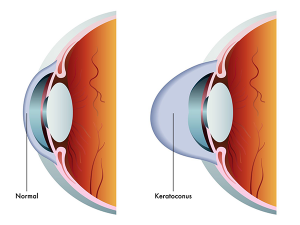 Treatment of Retinal Detachment: Some retinal detachments, if diagnosed when the detachment is small, may be treatable with only laser photocoagulation or cryotherapy. More often, however, if retinal detachment occurs, more extensive surgery is usually needed. The surgical procedures, which are frequently used for repair of retinal detachment, include pneumatic retinopexy, scleral buckle and vitrectomy.